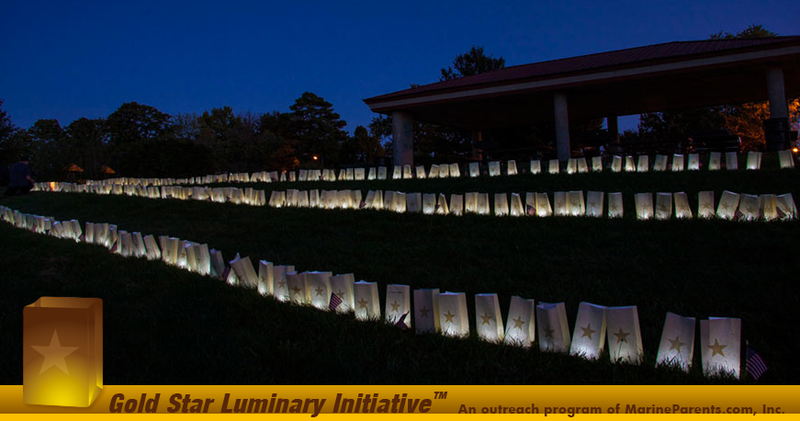 This Sunday, September 25, is Gold Star Family Day, a day on which organizations and individuals in communities throughout the United States come together to light luminaries at dusk on the last Sunday of each September in honor of our fallen heroes. Learn more in our first article. The support you, the Marine Parents family, have shown for the Gold Star Luminary Initiative this year has been remarkable, and we'd like to encourage all of you who haven't already done so to change your social media profile picture this Sunday in honor of Gold Star Family Day. 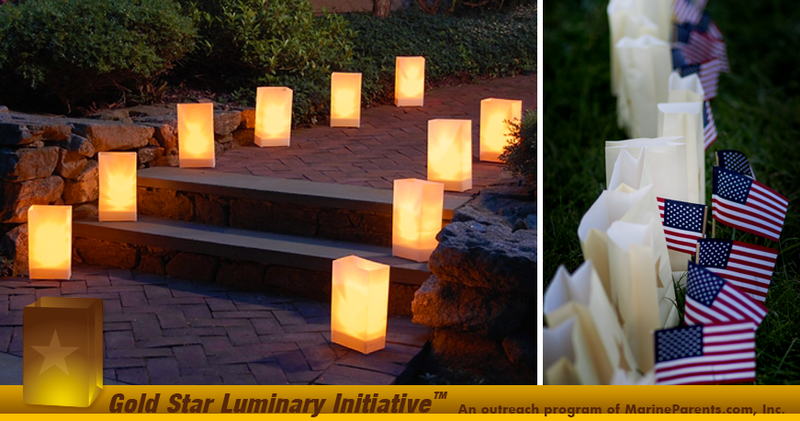 We would also like to encourage all of our readers who haven't purchased Gold Star Luminary Initiative luminary kits to light a candle in your window this Sunday to show your support for Gold Star families. Whether it's a few luminaries on a front lawn or hundreds in a community event, the impact of your show of support is the same: the country shares in these losses and we strive to keep the memories of these men and women alive. Thank you for your continued support of Gold Star families. En el Día de Familia de la Estrella Dorada*, nos unimos en honor aquellos que han perdido un ser querido sirviendo en las Fuerzas Armadas de USA. El último domingo de septiembre, los honraremos encendiendo una luminaria. A lo largo de la Historia de los Estados Unidos, desde la guerra revolucionaria a las guerras en Irak y Afganistán, las familias han visto a sus seres queridos responder al llamado del deber; y con esa labor viene la carga máxima que estas familias deben soportar. Hagámosles saber que no están solos encendiendo una luminaria en el día de la familia de la Estrella Dorada. For many Marines finishing their four years of service, active-duty is not the end of their career in the Marine Corps. All Marines are required to go through the Individual Ready Reserve (IRR) after their initial active-service comes to an end, unless he or she chooses to reenlist. *Image info: San Diego IRR Marines attend mega-muster. While the challenges faced by wounded and recovering warriors and veterans are well-documented, many people not be aware of the challenges faced by the men and women who act as caregivers for wounded and recovering warriors and veterans. It's not uncommon for caregivers to experience, at various times, feelings of anxiety, guilt, anger, helplessness, and grief. 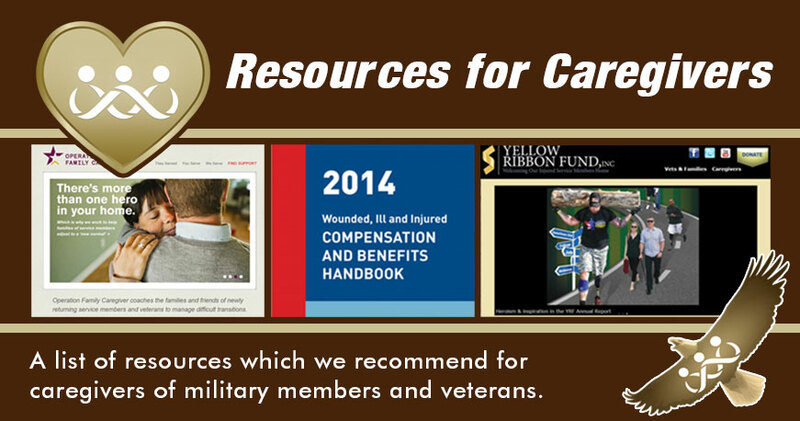 As such, the Warrior Support Team provides resources and support for military caregivers. Your Marine has a 4-digit MOS number that corresponds with the title of his/her Military Occupational Specialty. Typically, your Marine will have selected an MOS during the enlistment process. *Image info: Marine Special Operations Officers (SOOs) graduating from Marine Corps Forces Special Operations Command's (MARSOC's) Individual Course will be assigned a new Primary Military Occupational Specialty, clearing the way for retention and promotion in a professional career path. (USMC photo by Corporal Donovan Lee). Hispanic Heritage Month runs from September 15 - October 15 and in recognition, we'd like to take this opportunity to highlight one of the most famous Hispanic Marines to have served in the Marine Corps--Roberto Clemente. 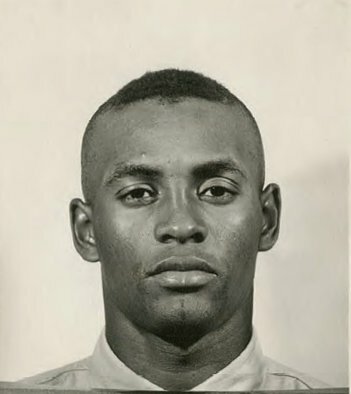 *Image info: Roberto Clemente (USMC photo/released). 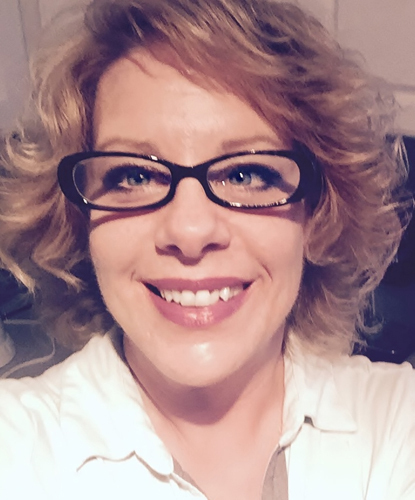 This week's featured volunteer is a proud Marine mother from Delaware--Eileen Wellborn Adams. Eileen has been a Marine Parents volunteer since October 2015, currently serving as the Company Leader for Fox Company, 2nd Recruit Training Battalion. In her role as Company Leader, Eileen coaches and supporting the families of Fox Company recruits through each thirteen week boot camp cycle. *Image info: Eileen Wellborn Adams. (Image used with permission). This week in Marine Corps history, a 40-acre training facility for Military Operations in Urban Terrain (MOUT) at Camp Lejeune, Marines crossed the Han River, and Marines and seamen from the USS Pensacola and the USS Benicia landed at the Bay of Panama in what is now Colombia. 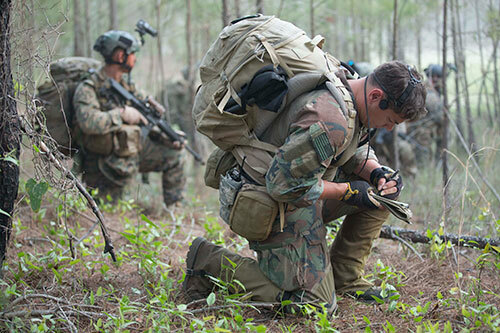 *Image info: (Left) Corporal Tanner Pollock, holds security while Lance Corporal Ryan Zerites calls in a 9-line medical evacuation request during Military Operations in Urban Terrain, or MOUT, training aboard Camp Lejeune, North Carolina, April 8, 2015. (USMC photo by Corporal Krista James). (Center) American and Korean Marines cross the Han River in an LVT-3c of the Marines' 1st Amphibian Tractor Battalion. (USMC photo/released). (Right) The USS Pensacola in Alexandria, Virginia, in 1861. (U.S. Navy photo/released). Secretary of the navy Ray Mabus has announced that two Arleigh Burke-class destroyers named after World War II Medal of Honor recipient Marines have been commissioned. The remains of a Marine killed in World War II during the Battle of Tarawa have been returned to his hometown in West Virginia. (Center) Louis H. Wilson Jr. (US military photo/released). (Right) Emmett Kines (US military photo/released). 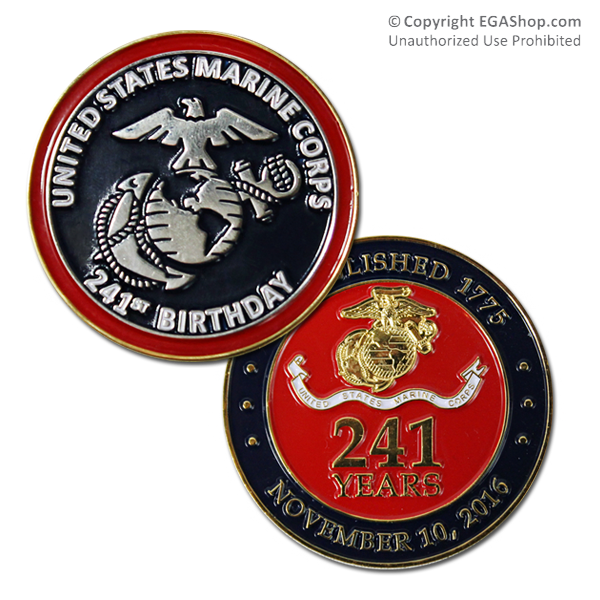 This limited edition 2016 Marine Birthday Coin (44mm), finished in both silver and gold colors, celebrates 241 years of the Marine Corps and was designed by the EGA Shop! You won't find it anywhere else! These coins sell out quickly every year so make sure you purchase today!